Throughout the month of May, our volunteers have been diligently soliciting donations of new and gently used children’s books for our program. All books collected will later be brought to the prisons in which we film. Once there, parents preparing for filming are able to select books they feel are most suitable for their children. When video recording begins, the parents read the books they’ve chosen as part of their personal messages. The books are sent home with the DVDs, allowing the incarcerated parents to read to their children from afar. While we accept book donations throughout the year, spring is the time of our greatest need. The majority of our filming takes place just before Mother’s Day and Father’s Day, with Christmas being the second-most busiest time. Because we see great importance in keeping kids connected to their parents, especially through significant holidays, there is a stronger push for donations during these times. This year, we tried to expand our reach by creating and promoting a Facebook event with details on how anyone can donate. The great news? It worked! The power of social media has brought us a significant response to our call this year. We’ve received boxes of books from all over the country, and we haven’t lost momentum. 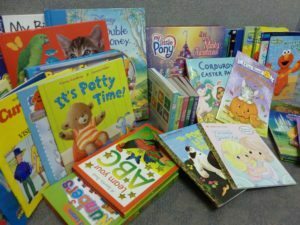 The staff members of Studio East Salon in Norfolk, Virginia, were so inspired that they began a book drive of their own. Customers have been encouraged to drop off books or monetary donations on their next visit to the salon. As if that isn’t already cool enough, this drive actually brought in a box of books for Spanish-speaking families! This is an area of growing need, so it is immensely appreciated. 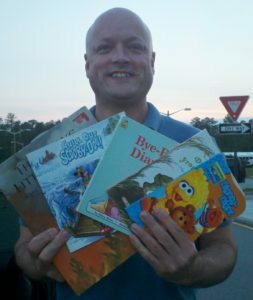 Brian Inks, a member of The Messages Project Board of Directors, personally collected more than 120 books in Virginia this spring. He also forwarded 2 gift cards that were donated to be used to purchase more. We send our most sincere thanks to Sgt. Robert VanAusdall, U.S. Army, for his contributions to Brian and our program. Another member of our Board of Directors, Katie Brownlow, was able to collect many children’s books from her co-workers in New Jersey. It is indeed inspiring to see how far the word of our need has spread and how many charitable folks there are who so graciously give to the children in utmost need. We also created an Amazon Wish List to assist our supporters in donating with ease. Don’t have extra books at home to send us? Looking to avoid personal shipping costs? Send us a gift from Amazon! We’ve carefully selected popular children’s titles, including many focused on parent-child relationships and dealing with separation. Next time you’re placing an Amazon order for yourself, please consider adding a book or two from our Wish List to your cart. It will ship directly to us without any further effort on your part. It’s that easy! Please use this opportunity to tidy up your bookshelves at home, sending any like-new children’s books our way. As we near the end of the school year, it wouldn’t hurt to mention this to school teachers you know. Many are cleaning out their classroom shelves around this time, and we will gladly take their extra books to use in filming. From one loving home to the next, these books mean so much more than you’ll ever know.